One of my New Year’s resolutions last January was to improve my baking and writing skills, a dual goal that I pursued by starting this blog. While the success of this resolution remains to be seen, I can safely say I did bake much more consistently and attempted many more challenging recipes once I had a vehicle for recording my output. Thanks again to all you dear readers for encouraging me to keep going on with this project! My other baking-related resolution I did not succeed in accomplishing so well, and that was to decrease my purchase of baking books. My boyfriend has uttered the phrases, "Didn’t you just buy another cookbook last week? ", "Wait, I thought you wanted to finish baking from that book first before you got a new one", and "I got a package from Amazon for you at the office" more times in the last year than I care to remember. My sole defense is that I have not regretted a single one of these purchases – indeed, they have been vital to the continuation and growth of my blog – as I’ve documented each new inspiration on this page. On some days my list of "recipes to make" seems dauntingly long, but most times it makes me excited that there is still plenty for me to bake and learn from. Chloe Doutre-Roussel’s The Chocolate Connoisseur : Undoubtedly the cutest book I bought in 2006, a slim, candy-pink volume that could fit in a back pocket and be whipped out for reference at the chocolate shop. Roussel is utterly obsessed with chocolate, and happily shares her stories of a life devoted to the divine theobroma cacao, as well as her expert advice on how to taste and appreciate the ever-growing bevy of artisan chocolates proliferating the gourmet stores. Dorie Greenspan’s Baking: From My Home to Yours: What else needs to be said about the biggest hit in the baking blogosphere in 2006? After brilliant collaborations with Pierre Hermé and Julia Child, Greenspan provides entry to her own kitchen, a warm, inviting, sugar-and-vanilla scented bit of heaven. Her sweet, intimate writing assures yes, you can also make all these wonderful recipes in your home! Emily Luchetti’s A Passion for Ice Cream : A most welcome sequel to her wonderful A Passion for Desserts , this book arrived just in time for summer and for me to kick my ice cream maker into overdrive. Luchetti again assembles a delectable collection of recipes that show off her talent for creating fresh and intriguing combinations of flavor and texture in beautifully composed desserts – all of which include ice cream. It will make you never want to settle for just a scoop of ice cream again. Dominique and Cindy Duby’s Wild Sweets : Although this book was originally published in 2004, it quickly disappeared and was maddeningly hard to find. Its re-release in paperback in 2006 was cause for celebration – after visiting the Dubys’ fantasyland of a site, I was eager to find out more about their cutting-edge pastry. It’s a beauty of a book, a melding of food and science and art: gorgeous photos of desserts as precisely assembled as museum sculptures, recipes that look more like science experiments. My eyes were wide open after poring through this book. Kate Zuckerman’s The Sweet Life : I was not familiar with Zuckerman or her desserts at Chanterelle, but once I flipped through her book I realized how remiss I was in not learning about her earlier. It’s one of the most visually appealing books I’ve seen, neatly and intuitively laid out – a pleasure to read. The recipes are sophisticated, inventive twists on old favorites, but what really sets the book apart is her detailed instructions – if you’ve never figured out what "beat until light and fluffy" means, she actually explains it, giving a description of what to look for and when to stop. A beautiful de-mystification of the art of baking. The Culinary Institute of America’s Chocolate and Confections : Peter Greweling, master confectioner from the Culinary Institute America, has produced what looks like a very comprehensive bible on chocolate and candymaking, with formulas for almost every confection imaginable. Emily Luchetti’s Classic Stars Desserts : Luchetti makes another appearance with a compilation of recipes from her first cookbooks, Stars Desserts and Four-Star Desserts. As these books are out of print now, another chance to experience recipes from these classics is most welcome. Ann Amernick’s The Art of the Dessert : Amernick has been assistant pastry chef for the White House and pastry chef for Jean-Louis at the Watergate, and now has her own restaurant in Washington, D.C. Her latest book looks to be a stunning demonstration of her craft. Eric Kayser’s Sweet and Savory Tarts : If you can’t make it to the marvelous Boulangerie Kayser in Paris, now you can have the chance to experience some of his delectable creations. (His book on bread, 100% Pains, is sadly only available in French). Pichet Ong’s The Sweet Spot : Ong is famous for infusing Asian flavors into his desserts at New York City restaurants Spice Market and 66. He is finally coming out with his own Asian-themed dessert cookbook, filling a gap in the cookbook world. I am quite eager for this one! I think your baking and writing are wonderful and don’t need much more polishing! You’re spot on with your description of The Sweet Life. Love that book. And I just added Chocolate and Confessions to my wishlist after reading this. Aww I am quite envious of your cookbook collection! I know I’ve enjoyed reading and seeing all of the fabulous recipes you’ve pulled from these books – and I can not wait for what you’ll be creating from 2007’s books! Yay! Thanks so sharing those inpsiring books that you have on your bookshelves. Certainly, a baker can’t do without those cookbooks to give them inspiration to improve and move on to greater heights! It’s funny how my hubby had made the same comment about my cookbook purchases, but I think he has accepted the fact that I am a hopeless case. He does know that I actually use them so it somehow justifies the purchase. Anita, how can we possibly be faulted for loving cookbooks so much? I agree wholeheartedly with your assessment of both A Passion for Ice Cream and Wild Sweets. They are full of special ideas for the dessert obsessed, though Wild Sweets is not the most accessible book for the home cook. I’m looking foward to the CIA book so much! Happy New Year to you Anita. I am not regretting a single moment your cookbook purchases! May them keep your baking come our way 😉 I love it! Glad to hear you enjoy Kate’s book as well! 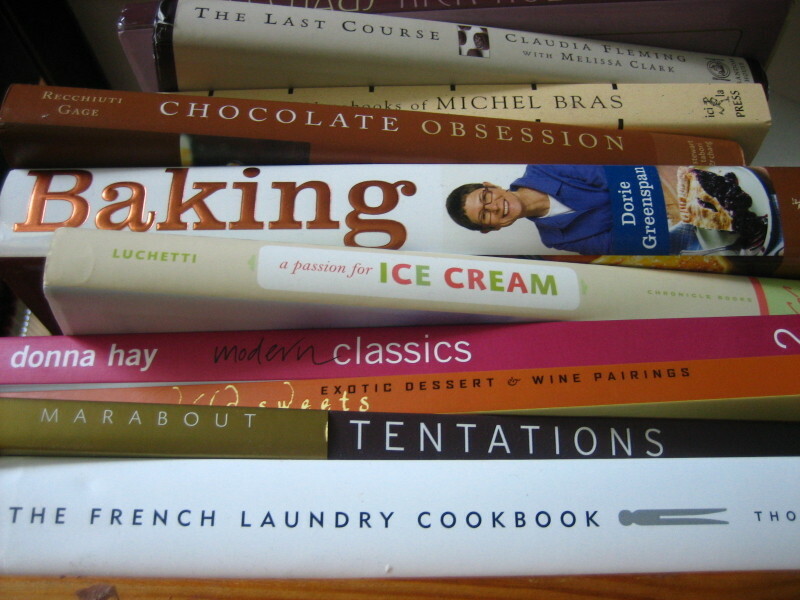 2007 is looking to be a good year for cookbooks indeed! Thank you! I’m looking forward to being inspired by the new crop of books this year! Thanks so much for your continued support – I’m glad you are enjoying baking as well – there’s always something new to try! My boyfriend has stopped being surprised at the guilty look I get when he asks if I’ve made anything out my newest books yet – he knows this is one unstoppable habit! Glad to know so many people support the need to continuously augment one’s cookbook collection:) The recipes in Wild Sweets are a little daunting, but it’s thrilling to see a couple pushing the limits of pastry and science! Happy New Year to you! Of course I’m thrilled to have my tastes verified by a fellow cookbook connoisseur:) I can’t wait to see what you’ll make from this new batch of books! It looks fantastic, doesn’t it? I hope to see what you make from the book! Happy New Year to you too! I am looking forward to being inspired by all these gorgeous new books coming out! Derrick on An Obsession with Food has an amusing rant on wine words in Varietal Is The Spice Of Life….